I found these palettes at my local Buck or Two Dollar Store. I will admit I got pulled in by the cute packaging and bright colors. There were lots of choose from but I settled on two. I didn’t want to buy all of them and en up not enjoying the product. 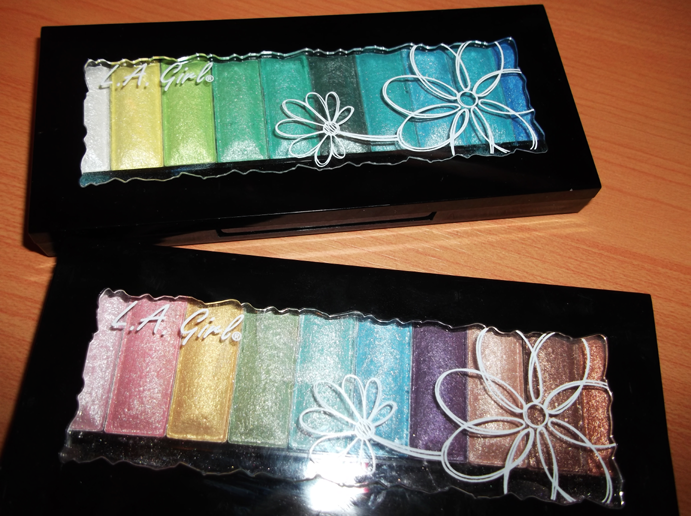 I got the green/blue palette in ‘Vivacious’ and the rainbow/brown palette in ‘Prism’. Each palette has ten shadows with a total net weight of 0.39 oz/11 g of product. The palettes sell for $7.00us each on the L.A. Girl website (http://www.lagirlusa.com/High-Definition-10-Color-Palette-2113.html) I got them for $6.00can at the store. These shadows have a shimmer texture but not glittery. Some colors are a little sheer while others are very bright. The swatches I have to show you are a dry application. However let me say now. I use a little bit of mixing medium and the color was very opaque! I was very surprised. However I haven’t seen anywhere that states that these can be used wet. So I’m going to test on my palettes and if it doesn’t ruin them I will make another post with swatches of a wet application.